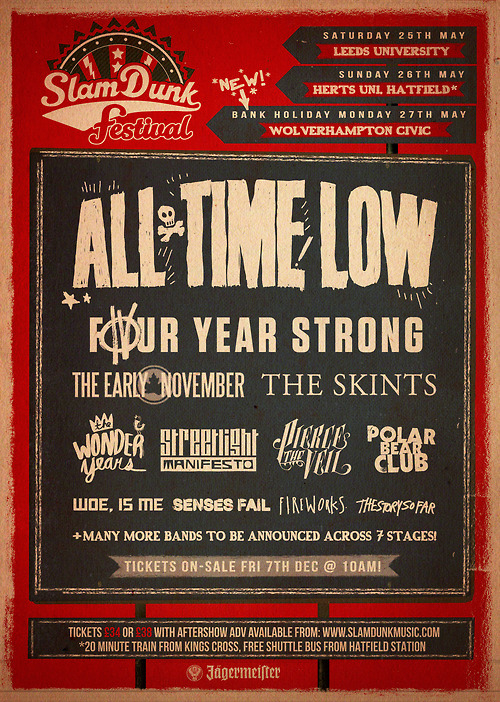 The 2013 Slam Dunk Festival has been announced and UTG has all the details here! The event will be held from May 25 through the 27 in the United Kingdom and the first run of bands have been unveiled. All Time Low, Pierce The Veil, Four Year Strong, The Early November, The Skints, The Wonder Years, Streetlight Manifesto, Polar Bear Club, Woe Is Me, Senses Fail, Fireworks and The Story So Far will all be playing. Tickets go on sale December 7. View the 3 dates for the festival below and click through to check out the official festival poster. Keep it tuned right here on Under The Gun for the next batch of band announcements.